Looking for a cheap ticket to Surabaya? Here you can search all major low-cost airlines for cheap flights to Juanda International Airport (SUB). 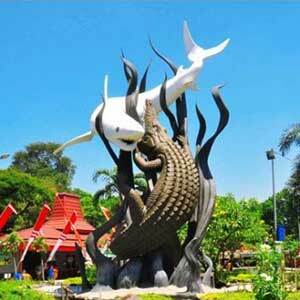 The Juanda International Airport is located 10km from the Surabaya city center. A taxi from Juanda International Airport to Surabaya center would cost IDR 110.000. Before you book a flight you can use Utiket to find the cheapest flights to Surabaya for Lion Air (JT), Citilink (QG), Batik Air (ID), Garuda Indonesia (GA), Sriwijaya Air (SJ), Wings Air (IW). All flight data are real-time and accurate. Follow the links to search and book your cheap ticket to Surabaya directly with the airline or one of our partnering travel agents. Juanda International Airport is the 2nd largest and 2nd busiest airport in Indonesia after Jakarta Soekarno-Hatta International Airport. The airport was named after Djuanda Kartawidjaja, one of Indonesia's Prime Ministers. Juanda has an expanding selection of domestic routes, including direct flights to Lombok and Kalimantan, and international routes to Singapore and Kuala Lumpur, among others. Read more about Juanda International Airport. This is a list of all airlines flying to and from Surabaya and how many flights and destinations they serve. You can see a complete list of airlines and flight options to Surabaya. Need place to stay in Surabaya?